An upscale, high quality base. Red Label chicken broth base offers the best in ingredients with high levels of natural flavours and extracts. FOR SMALL QUANTITIES DISSOLVE 28 G (1 OZ) CHICKEN BROTH BASE IN 1 L (35 FL OZ) BOILING WATER. YIELD APPROX. 6 SERVINGS OF 170 ML (6 FL OZ). FOR LARGE QUANTITIES DISSOLVE 450 G (APPROX. 1 LB) CHICKEN BROTH BASE IN16 L (3 1/2 IMP GAL) BOILING WATER. YIELD APPROX. 94 SERVINGS OF 170 ML (6 FL OZ). This versatile base can be used as a soup or sauce base. 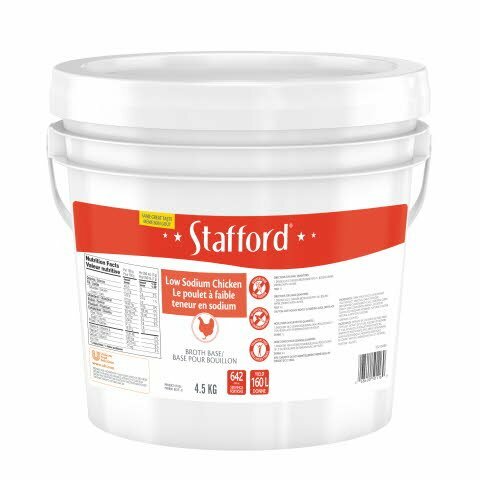 Product is packed in a 4.5-kg pail for smaller volume applications. Low in sodium. Use wherever a rich hearty chicken stock is required.